School Assemblies and After School Programs will never be the same again! Complement your Dinosaur, Rock and Mineral curriculum and bring it to life...Imagine, your kids can take home genuine fossils or a mineral collection! 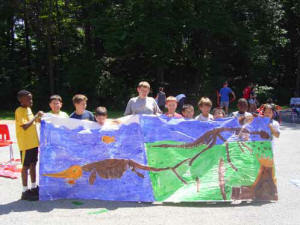 Amazing Presentation, Fossil Dig and Panning for Gems & Minerals with our School Assemblies and After School Programs. 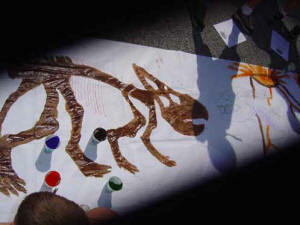 Its like bringing the Natural History Museum to your school assembly or classroom! 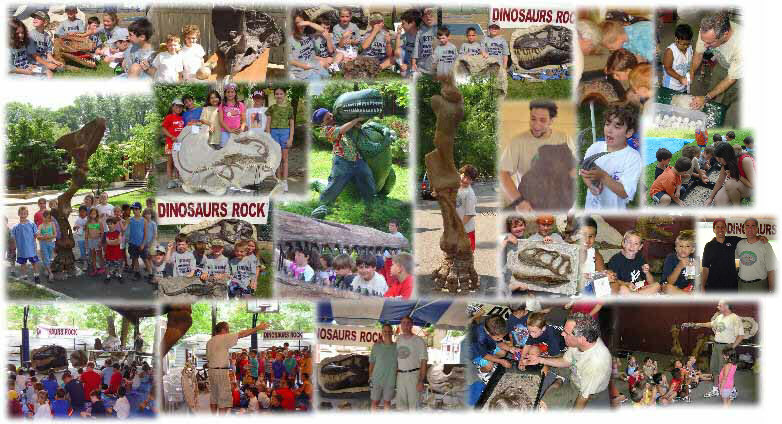 School Assemblies and After School Programs with Dinosaurs Rock is a fascinating Dinosaur, Fossil and Mineral Adventure every kid dreams about. Our School Assemblies transform your school assembly, classroom or gym into a Museum. You will have a myriad of museum-quality (many genuine and life-size) dinosaur fossils and other prehistoric related items items right in your own school. 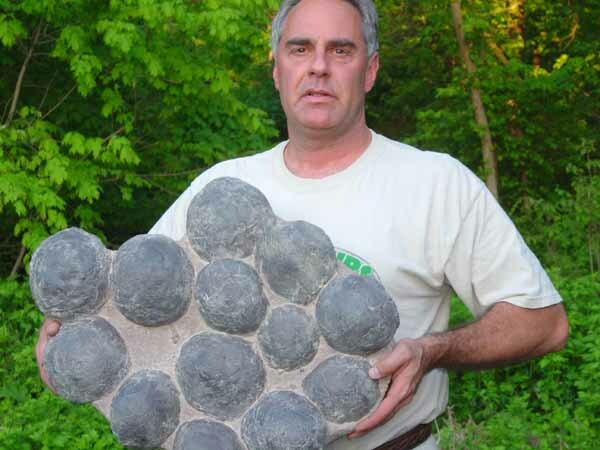 Your students will see items that are 10,000 to over 500 million years old. The visual display will be amazing! A great addition to your earth science curriculum. Kids will be able to see and touch these items up-close, including the newest additions to our collection, a 9 foot leg of an Ice Age Mammoth, genuine Dinosaur Eggs and Dinosaur Footprints plus lots more. 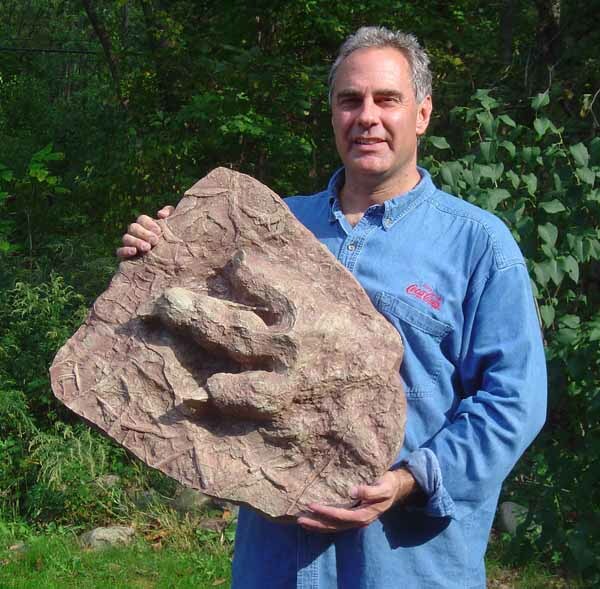 Dear Mr. Brown Thank you so much for presenting Dinosaurs Rock at our school. Your show was said to be one of the best assemblies we've had in a long time! The collection you presented surpassed our expectations as well as your performance. You kept our children from grades K-5 engaged in the program from start to finish, and most of them didn't want to leave. Your were a pleasure to work with and I look forward to having you back for future programs! 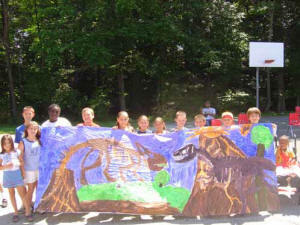 School Assemblies with Dinosaurs Rock is a lively educational experience for your student school assembly. Prehistoric life outside of dinosaurs – sharks, insects, etc. 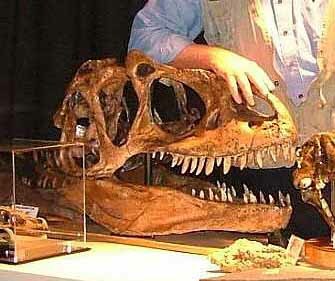 Scientific clues - how we learn about prehistoric life & dinosaurs, e.g. footprints, egg nests . . .
Y our School Assembly includes a genuine Fossil Dig. 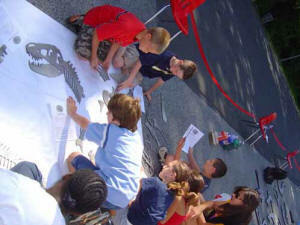 Your students will have the opportunity to discover and keep genuine fossils. As they participate in this hands-on activity, they will be awed as they uncover genuine dinosaur bone, shark teeth, ammonites, petrified wood and more. Best of all, they will be taking some fossils home, the start of their own collection! Our School Assembly programs can be presented to 50-500 or more students, done in consecutive sessions. Prices start at $500. Call us for pricing details. We would be happy to tailor the presentation to best complement your teacher/class curriculum and Science Day activities. We want to make your School Assembly the best you have ever experienced. We need to park and unload as close the the area where we will be presenting. Please speak with us prior to booking to make sure set-up area is appropriate.